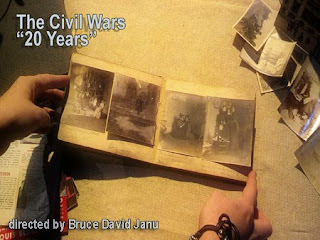 We recently produced a video for the song "20 Years," by the Civil Wars for a competition sponsored by genero.tv. All live action in the video was shot entirely on a Motorola Droid Razr smartphone. Although the video did not win the competition, it did draw attention to the story of Jayne Bartlett Kerr. Click here for the Press Kit. Still from video for "20 Years"
Jayne B. Kerr and Lous B. Kerr. February, 1900. Jayne B. Kerr and Clara Schwanecke, 1902. Marshall, Illinois. W.I.A.U., July 1902. Marshall, Illinois. Clara Schwanecke and Jayne B. Kerr. May, 1902. Marshall, Illinois. The video is about an old photo album discovered in an antique store. A young woman thumbs through the worn and faded images and is confronted by a humanity that is timeless: family, laughter, friends and love. The mere survival of the photo album beyond the life of its owner hints at true immortality. The photo album is real and was owned by a woman named Jayne Bartlett Kerr, who lived most of her life in Marshall, Illinois. Bruce Janu, the director of the video, bought the photo album many years ago in an antique shop. He always loved old photographs and this album, in particular, had some great turn of the century images. He never intended to make a music video about the album, but when the opportunity arose he though that the album would make a great centerpiece for the Civil Wars' song. He bagan to research the album and learned a little about it's previous owner. Jane Bartlett Kerr is the true star of the music video. She was born in Marshall, Illinois on January 8, 1879. On May 12, 1898, Jayne married Louis Bartlett Kerr and on July 5, 1899, their first and only child, Louis Bartlett Kerr was born. Jayne's husband, Louis, was many years older and the couple experienced maritial problems that eventually ended in divorce. What happened to Louis is unknown. In the federal census of 1910, Jayne and her son are the only people listed at their residence on Plum Street in Marshall, Illinois. Jayne's status is listed as "divorced." On the 1920 census, she is listed as "divorced" and "widowed." Jayne Bartlett Kerr was very active in her community. So active, in fact, that an artist included a small figurine of Ms. Kerr to highlight important women in the history of Illinois for an exhibit that went on display in 1929. She was a member of the Illinois State Historical Society and a member of Daughters of the American Revolution. Louis Bartlett Kerr attended the University of Illinois briefly in 1920 and received 16 credit hours in mechanical engineering. What became of him is not known. Jayne was active in the State Tuberculosis Association, becoming its field secretary in 1919 and the executive secretary in 1926. She traveled all over the midwest raising money for those afflicted with tuberculosis. Jayne Bartlett Kerr died on July 16, 1929 due to complications from surgery she had in Chicago. She was only 49 years old. The photo album features snippets from her life, 1900-1902. She spent some time in Oshkosh, Wisconsin and visiting her mother in Indiana. Her husband only appears in a few pictures and they are never shown together. The other person featured often throughout the album is Clara Schwanecke. It can be surmised that Clara and Jayne were very close friends. Some of the best pictures contained in the photo album are of Jayne and Clara, including a delightful picture of the two of them sitting on the floor with their heads sticking through newspapers.